The cirrocumulus lacunosus is a cloud variety that stands out in the crowd due to the large gaps that intersect the cloud formations. In other words, the overall appearance of this pattern is more clearly suggested by the Latin lacunosus attribute, which is translated as in full of holes. Due to its façade, this cloud structure can also be described as having the shape of a honeycomb or a net. While it can develop at all levels of the atmosphere, it is important to note that it is mostly common for the high end clouds. Nonetheless, the lacunosus structures are in fact vary rare and can be observed seldom. How are cirrocumulus lacunosus clouds formed? At its heart, the lacunosus cloud formation is nothing more than a cirrocumulus that is crossed by numerous holes, which are in fact small pockets of air. Even though, by definition a cirrocumulus cloud is formed of ice crystals, sometimes, it can also contain water and ice simultaneously. What this means is that the altitude at which the clouds are normally found includes both hot and cold air fronts. Because the cold air fronts have a higher density than warm ones, when both of them are present the cold air goes through the warmer front and creates the specific holes and characteristic of the lacunosus cloud formation. What do cirrocumulus lacunosus clouds look like? Even though its shape is not nearly as perfect as a honeycomb, for the ground observers this is the most accurate comparison regarding the lacunosus appearance. The main difference between the honeycomb and the lacunosus is the fact that while the first one’s cells are hexagonal and are parallel, the hot and cold air fronts do not create such perfect angles and shapes for the lacunosus holes. It is important to note that the lacunosus clouds should not be confused with the fall-streak holes, which are also a rare site in the cirrocumulus and altocumulus cloud formations. The main difference between them is that lacunosus presents lots of gaps, while the fall-streak holes can be described as a single large hole, that was repeatedly mistaken for UFOs in the past. Where can I see cirrocumulus lacunosus clouds? Wherever the conditions for the formation of a cirrocumulus or any of its varieties are met there is also a chance for the lacunosus to appear. Overall, these high clouds can form anywhere around the globe and hence, people can observe this rare and unique pattern regardless of their location. 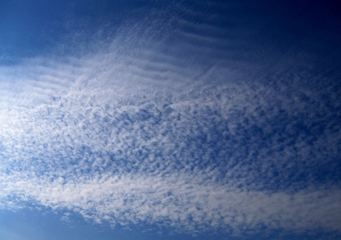 On a side note, the cirrocumulus cloud formations are usually common from late October to March.